ADERA, Israel (MCT) Israel has gone through one of the driest winters in its history, but despite the lean rainy season, the government has suspended a long-standing campaign to conserve water. The familiar public messages during recent years of drought, often showing images of parched earth, have disappeared from television despite weeks of balmy weather with record low rainfalls in some areas. The level of the Sea of Galilee, the country's natural water reservoir, is no longer closely tracked in news reports or the subject of anxious national discussion. The reason: Israel has in recent years achieved a quiet water revolution through desalination. With four plants currently in operation, all built since 2005, and a fifth slated to go into service this year, Israel is meeting much of its water needs by purifying seawater from the Mediterranean. Some 80 percent of domestic water use in Israeli cities comes from desalinated water, according to Israeli officials. "There's no water problem because of the desalination," said Hila Gil, director of the desalination division in the Israel Water Authority. "The problem is no longer on the agenda." The struggle over scarce water resources has fueled conflict between Israel and its neighbors, but the country is now finding itself increasingly self-sufficient after years of dependency on rainfall and subterranean aquifers. Israel's experience might also offer some important lessons, or at least contrast, for states like California. Now gripped by drought, with the all-important snowpack averaging only 26 percent of normal, California has struggled with desalination efforts in the past. At present, more than a dozen desalination projects are at various stages of planning in the state, and the California Department of Water Resources will be announcing a new round of desalination grants in May. The grants are very modest, though; the last round, for instance, offered just $45,000 to study the technology in southern San Luis Obispo County. The plants themselves, meanwhile, are costly and frequently controversial. One big plant built two decades ago near Santa Barbara, in the final years of an earlier drought, is now dormant. Officials estimate it would cost $20 million or more to reactivate it. A proposal for a 50 million-gallon-per-day facility at Huntington Beach in Southern California would cost hundreds of millions of dollars to build. In November, the California Coastal Commission postponed granting the project a permit pending more studies. Each of Israel's plants cost between $300 million and $450 million to build. The plants are privately owned and operated, under a contract with the government, which buys the water from the plants. The budget for water purchases comes from water charges to consumers. The plants are not subsidized. Israel's efforts to solve its water shortage haven't ended with desalination. The country treats and recycles more than 80 percent of its wastewater, using it primarily for agriculture, making it a world leader in that field. At a water desalination plant on the sea near the northern Israeli town of Hadera, water pumped in from the Mediterranean is pushed through rows of multi-layered plastic membranes and, through a process called reverse osmosis, emerges after 90 minutes as tasty drinking water. The company that runs the facility, IDE Technologies, which is based in Israel, recently showed foreign visitors around the plant, touting its performance along with another plant at Soreq, near the southern Israeli coast, the largest reverse osmosis desalination plant in the world. That plant produces 150 million cubic meters of potable water a year. IDE is also involved in building seawater desalination plants abroad, including what is expected to be the largest such plant in the Western Hemisphere at Carlsbad, Calif., able to provide 50 million of gallons of potable water a day. The Israeli plants, mostly located along the coast, operate at high energy efficiency and are some of the most cost-efficient in the world, when measured against similar plants in other countries, according to official figures. Desalinated water at the Soreq plant is produced at the price of 52 cents a cubic meter, according to terms of a government tender, and while actual rates fluctuate according to energy costs, currency exchange and the cost-of-living index, they remain significantly lower than in other nations. 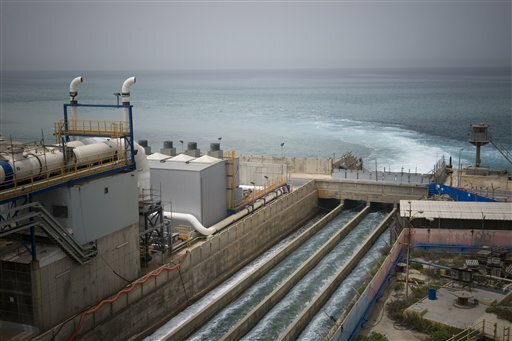 But environmental experts caution that desalination has its costs, among them high energy consumption from power plants that emit greenhouse gases, use of scarce land on Israel's crowded seacoast, and emission of highly concentrated saline water and chemicals into the ocean, with unclear environmental consequences. "In Israel, environmental costs are not taken into account when calculating the costs of desalinated water," said Nurit Kliot, a professor of environmental studies at Haifa University. Gidon Bromberg, Israeli director of Friends of the Earth Middle East, a regional environmental group, said desalination should be part of integrated water policy that included conservation and use of solar energy to power desalination plants. "A level of desalination is absolutely necessary because the population of this region has gone way beyond the carrying capacity of natural water resources, but desalination needs to be brought in not as the first option, but as the last option," Bromberg said. "Water conservation is now out the window," Bromberg noted, lamenting the suspension of the campaign to save water. Bromberg said the government needs to encourage efficient water use by reducing water subsidies for farming and by regulating crops to avoid those that require heavy irrigation, such as tropical fruits. In addition, he said, Israel is still at "an infant stage" when it comes to recycling what is known as gray water from sinks, showers and baths for use in toilets or gardens.